In Wednesday’s keynote, CEO Jim Whitehurst stated, "How we organize to generate innovation matters"—that includes the people, technologies, and practices that make up your IT organization. Traditional practices that worked in more stable business environments are being outpaced by a fast, unpredictable world. The future of IT then, according to Whitehurst, is about building IT that can handle whatever the future brings. The core tenets of this future-ready IT replace strategic planning with a new vision: try, learn, and modify . . . and this vision extends to the cloud. The cloud you need today won’t be the cloud you’re running tomorrow—just like your business, it will be adapted to meet the market. Today’s sessions gave insight on customizing the cloud to prepare for today’s—and tomorrow’s—business. Hybrid cloud not only combines key capabilities of both public and private clouds, but it can also serve as a gateway to pivot between legacy systems and newer, application programming interface (API)-based development. When creating a unique cloud services blend based on your specific business needs, you’ll also tune management of cloud and legacy environments to your specific development needs. Keeping your IT professionals engaged. Making the most of your resources and skills. Ansible playbooks can be used to automate app and security update roll out, perform full tasks, and create roles for different tasks across teams. These roles are easier to adjust, helping you automate incrementally, starting with daily tasks then progressing to full roles. 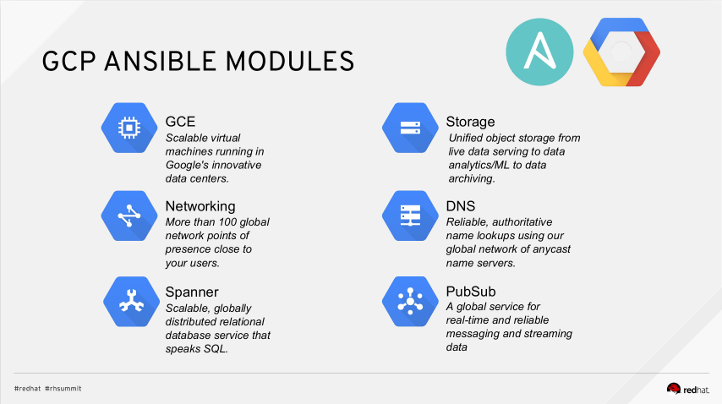 Google, an active collaborator on Ansible, has created modules that make up playbooks for Google Cloud Platform. From Ryan Brown and Tom Melendez's presentation. Establish a plan for provider downtime, pricing, etc. Be conscious of costs related to transferring data-heavy apps. Keep in mind that splitting a workload is harder than running some workloads in each provider’s environment. Take advantage of automation by sharing it between clouds with Ansible playbooks. Legacy IT doesn’t just disappear when you migrate to the cloud, even if it’s a complete single migration. The remaining risks of legacy IT—as well as the potential scale apps could reach—means designing greater security for an environment characterized by diversity. According to Mike Bursell and Ted Brunell at Red Hat, some legacy management tools will still work in the cloud, or required too much investment to abandon, but management must address the needs of your entire environment—including the dynamic changes of cloud. The security tools you’ll need are also unique. From Mike Bursell and Ted Brunell's presentation. Check that what you’ve implemented works according to your rules and policies—then you can automate to help reduce human errors and enforce the rules predictably. Clean up your data: Don’t keep old systems and workloads attached to your management services, even if they’re running OK.
Find your balance of cost, security, and performance: Involve business teams so they understand and have a stake in the process. Jared Sanders, principal operations engineer at cyber defense company Tapestry Technology, shared how these practices are being used in the public sector to help provide military-grade security. Understanding your unique workloads and use cases is key to cloud storage, according to Red Hat’s Sadique Puthen, senior cloud success architect, and Rahul Vijayan, senior storage specialist solution architect. "Getting your storage right is essential for your cloud. It may be at the bottom of your stack, but it shouldn’t be your last consideration." - Rahul Vijayan. Slide from Sadique Puthen and Rahul Vijayan's presentation. I/O size: Megabytes or terabytes? Protocol: What kind do you need: object, block, or file? I/O pattern: sequential or random? Throughput: Do you need high throughput? Tiering? Read—write ratios: Do you need more of 1 or the other? 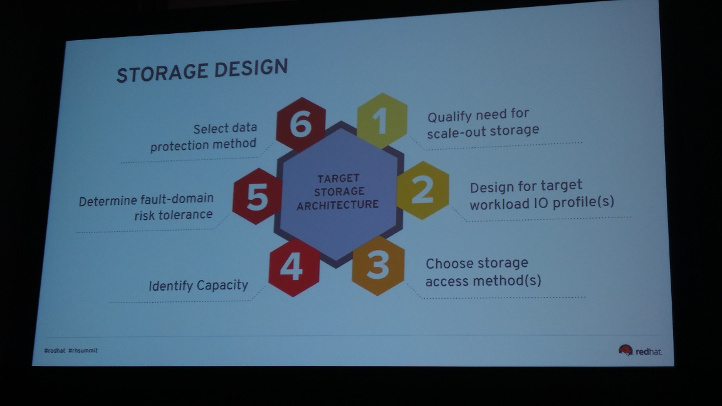 Vijayan shared specific storage considerations for OpenStack® clouds. Together with compute and networking, storage is part of the foundation of OpenStack. 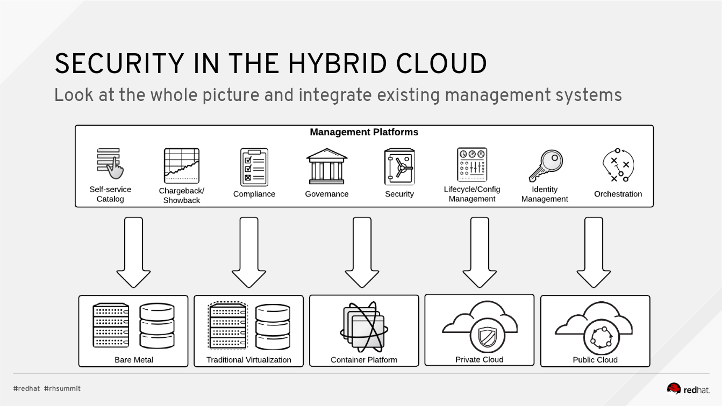 Cloud can be public, private, or hybrid. Similarly, OpenStack storage can be based in physical or cloud resources or a hybrid of the two. The composition of your OpenStack cloud storage, however, isn’t as important as its integration with OpenStack. The right solution should be tested and certified to help you save networking bandwidth, disk space, and time—and the right storage vendor should be able to give you a proof of concept showing how their solution integrates with your OpenStack cloud. So the key to OpenStack storage in a nutshell? Find a solution that not only supports your current environment but can support your future storage needs. From panels to sessions to customer stories, day two of Red Hat Summit brought more insight into cloud innovation from Red Hat and our technology partners. Tomorrow wraps up Red Hat Summit 2017. On site in Boston? Join us on the final day of Summit for more cloud sessions, labs, and training. If you missed our day 1 overview of cloud at Red Hat Summit, read it now. The OpenStack Word Mark is either a registered trademark/service mark or trademark/service mark of the OpenStack Foundation, in the United States and other countries, and is used with the OpenStack Foundation's permission. Red Hat is not affiliated with, endorsed or sponsored by the OpenStack Foundation, or the OpenStack community.